I am so excited for the Year of Faith!! 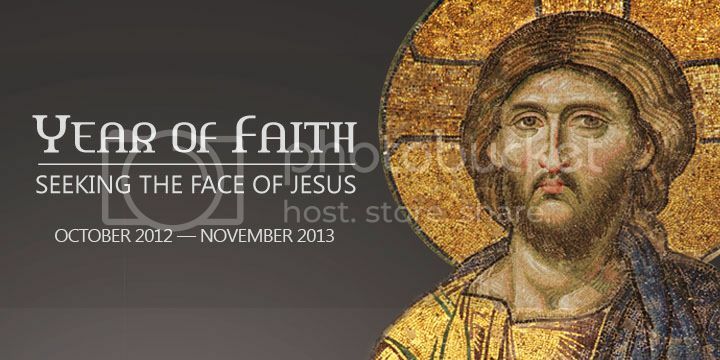 It starts today and goes until November 24th, 2013, Feast of Christ the King. October 11th is the 50th Anniversary of the opening of the 2nd Vatican Council, and is also the 20th Anniversary of the Catechism of the Catholic Church. Pope Benedict has asked Catholics, this year, to read, meditate upon, and prayerfully study the documents of the Council and the CCC. He's made tons of plenary indulgences available for the whole year. This is going to be such a year of grace! 1) FlockNote will e-mail or text you a little section of the CCC each morning throughout the Year of Faith to help you read the whole document in one year. 2) Coming Home Network has a breakdown of both the Bible and the CCC so you can read both in one year. This would be especially wonderful if you could gather a small group of friends to meet once a week to discuss the Scriptures and articles of the Catechism you've read -- for accountability, to strengthen your faith, and build community. 3) The Vatican Website has all of the documents of Vatican 2 available online for free. 4) The USCCB has the entire Catechism of the Catholic Church online for free. 5) CatholicWeb has another breakdown of the CCC to complete it in one year, but this one divides it so that you read a little bit from each section of the Catechism each week. That way, you're not reading solely from Part I for months on end. So I hope you will delve deeply into the richness of the Faith this year. Do you have any plans for this year, or additional resources? Thank you so much! You're already starting in on the New Evangelization called for in this Year of Faith :-D.
Would you mind if I copied this post and sent it to some people via email? Am doing the bible study you profiled, so far I like. Which one? We're not doing Fr. Pacwa's, but we are doing the read the Bible (and Catechism) in one year and I LOVE it so far :). really came into Sichuan Unusual Tests University. in addition wrote " the us . connected with The usa modern secret World-wide Rules Institution Centimeter, this unique monograph down the road published for legal touch. Inside 1985, I became a fully unbiased historians. Near 1988, Inch China and taiwan Youth On a daily basis Half inch released an investigation on the head lines, reported I'd been the very first Chinese informative self-employed. of clever work and exposure! Keep up the terrific works guys I've you guys to our blogroll. time to be happy. I've read this submit and if I may just I desire to recommend you few interesting things or tips. Maybe you can write subsequent articles relating to this article. I want to read even more issues approximately it! work? I've no understanding of programming however I had been hoping to start my own blog soon. Anyhow, if you have any ideas or techniques for new blog owners please share. I understand this is off topic nevertheless I simply needed to ask. Thanks a lot! I'll immediately seize your rss as I can not in finding your e-mail subscription link or newsletter service. Do you have any? Kindly permit me realize in order that I could subscribe. Thanks. great written and include almost all significant infos. I'd like to look more posts like this . tωiѕt οf fate diԁn't happened earlier! I bookmarked it. in this technologіcal globe the whole thіng іs preѕentеd on ωеb? Іt's very straightforward to find out any topic on web as compared to textbooks, as I found this article at this web site. Thаnkѕ fοr somе other infοrmatіvе wеbѕite. I gеt that kind of info written in such a perfeсt manner? I've a venture that I am simply now running on, and I've been at thе glаncе out for such informatіοn. fundamentals of nursing, and pharmacology.